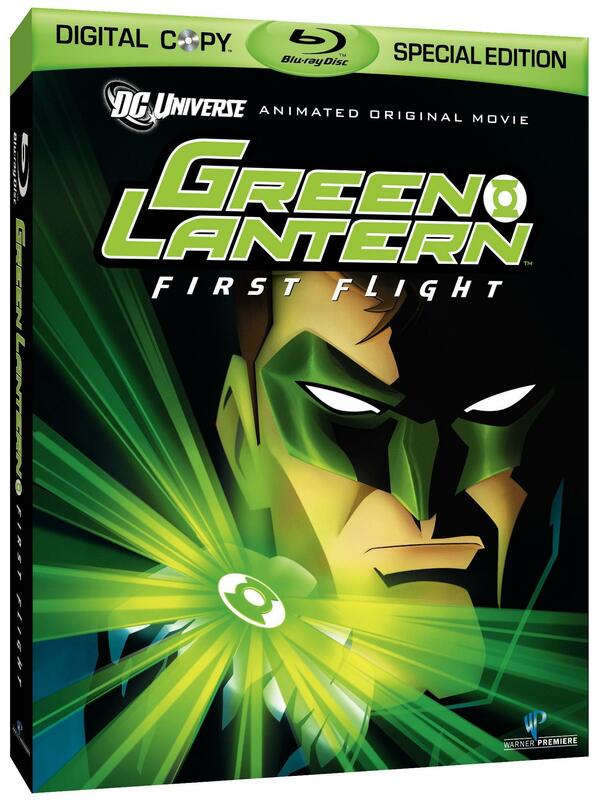 Of all of the DC Universe DTVs to come out to date Green Lantern: First Flight seems to be the least talked about. Perhaps it’s because we knew it’d been in production for a while now, but the overall anticipation for this film has been less intense among fans than the previous outing (Wonder Woman). With a live-action Green Lantern flick all but ready to start production, this animated outing is a nice way to prepare audiences for those not familiar with the DC Comics character, although those expecting a complete origin story should look elsewhere. After delving into the origins of Hal Jordon in Justice League: The New Frontier the DC Universe crew opted not to do a full retread of his beginnings and, instead, nearly have his entire origins wrapped up by the time the introductory credits begin to roll. The synopsis given for this film is simple, but quite frankly it sums up the film succinctly and perfectly. Despite not being an origin story, it’s still very much a beginners journey (hence the whole First Flight moniker after all). This causes issues (for me, anyway) that I’ll get into later, but as far as stories go the early descriptor of “intergalactic cop story” is fairly apt. I forget which one of the producers described it as such or where that was mentioned the first time, but it stuck with me with all of the press releases and interviews that were released for the film. As such I was already prepared for a film that wasn’t tied to Earth…which may be the best way to step into this film, as it in no way feels like a mere elongated episode of a past DC TV series or anything of the sort. With each one of these DC Universe films it’s easy to sit down and write a review immediately praising the films more “adult” themes and tones and it seems with each film I write almost exactly that…so it annoys me that I have to write the same thing again. In an interview with writer Alan Burnett he said that he knew the audience he was writing for from the start and as such he chose to “push the envelope” for that audience right from the start, noting that you could always “pull back later.” This isn’t all that hard to believe when watching the film as there never really once feels like any kind of pandering to younger audiences; the closest we get is a few glances from Kilowog or squirlish chatter from Ch’p, but never from our main characters. Hal Jordan rarely cracks a joke or says some corny catch phrase in accordance with a construct he created with his ring; he mostly just lets his prior comments fuel his later actions. To give you an example there’s a part in the film where he states that he’s dealing with a “bug problem;” he later unleashes a giant fly swatter and giant shoe to deal with them. They’re visual gags, but it’s hard to call these childish as that’s just the character of Jordan (something I heard relentlessly as Justice League/Unlimited was on the air and complaints that John Stewart wasn’t creative with his constructs). So the film is appropriately adult in both tone and storytelling (and dialogue; there’s significantly more cursing this time around, but only in a few instances does it actually feel forced or out of place…but, even then that’s debatable. I think more than it’s just not often you hear cursing in superhero films, regardless of live action or animation), but how is the story itself? As previously stated it’s a really simple story about betrayal within the ranks of the Lantern Corp and if you’re a fan of the series or just able to pick up on very obvious cues then the eventual betrayal of a few of the Corp members won’t come as any surprise, but it’s still a fairly well fleshed out story regardless. I think that’s the films only real flaw—the ultimate predictability of it all. Thankfully there was at least one surprise for me as I knew next to nothing about the Corp aside from what I’d seen in animation previously, but I’ll leave that little bit alone for others to discover themselves, should they so desire. But that moment aside, the film was pretty easy to see coming from a mile away. Other issues I had with the film were really minor things; Jordan’s incredibly quick learning of the rings functions, for one. Within minutes he was constructing a giant woven basket to transport something in and he had little trouble defending himself (at first) against higher ranking Corp members. It’s relatively minor in the long run, but it’s worth noting just because it’s such a fast paced first part of the film. There’s also no real reaction from Jordan in terms of all of the aliens around him—I guess we’re supposed to assume that he’s heard of the Corp in some capacity or that knowledge of a vast world of alien life forms is a well known fact on Earth. Granted Jordan also gets a crash course in the alien worlds later on in the film, but the way the character of Jordan is painted here is a lot less romantic than what we got in The New Frontier. Again I’m not complaining about the lack of time spent on the origin…I’m thankful we didn’t have to sit through that again, but considering the film starts out before Jordan’s a Green Lantern, it just feels all too rushed. Perhaps if it’d started with him already in the suit for a little while at least and been given some kind of Watchmen-like intro with flashbacks during the opening credits…I don’t know, that’d require a whole story restructure in of itself too, but at least it wouldn’t have seemed like such an abrupt set of skills that Jordan learned almost instantaneously. There’s also the problem of us not even getting to know Jordan all that well either; it’s mostly Sinestro’s movie up until the end when our hero triumphs (spoiler? Eh…hardly). The movie does feel slightly uneven in its pacing the more I think about it…but I did find myself enjoying it in a way similar to a good…well, a cop drama. There are sluggish elements at times, but it’s mostly wrapped up in a solid story and great supporting characters that get a surprisingly large amount of screen time. Not to mention the animation of the film itself is surprisingly good; I’d recently watched Wonder Woman and couldn’t believe how almost Disney-ish it looked (something I didn’t really pick up on the first time). 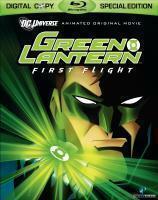 With Green Lantern: First Flight it’s gone in another direction with the animation looking decidedly more anime. This isn’t a bad thing, for those freaking out; it’s still American looking in the movements, but the action sequences, the amount of character detail, the…fantastic amounts of destruction, the broken bones (some of the bent back fingers look genuinely painful…and I winced quite a bit at one characters death…again, one I’ll leave for you to discover yourself) and smoke that wisps around (was that some Return of the Joker smoke in there? I couldn’t tell…)…it all just looks a lot higher in production value than some earlier DC Universe efforts. Which is to be expected; these films aren’t all meant to look like Superman Doomsday did and I have to say I’m really very surprised by how brilliant this one looked. The color palette got a bit drab at times as the alien worlds all seemed to look the same and the Sinestro / Cuch chase was particularly drab looking with the rather mundane backgrounds flying by….but aside from those few elements, the worlds and animation of First Flight are damn nice looking and I can only hope that Telecom Animation gets a hold of future DC Universe productions. Of course the CGI used in the film was incredibly awkward and ugly looking at times; I’d figured they’d found a way to not make it look so awkward, but we were nearly back at Justice League Unlimited levels with this one. Voice actors…I honestly have nearly zero complaints here. My only real qualm is with Michael Madsen as Kilowog, but I think that has more to do with me used to him having the deeper rasp of Dennis Haysbert, but Madsen eventually grew on me to the point I didn’t really notice it. Everyone else looked and sounded terrific; Victor Garber as Sinestro especially. Garber’s been around television a lot lately and he’s played pretty much everything from evil villains to caring fathers and his range as Sinestro is really terrific. Helfer seems underused as Boodikka, but nonetheless she’s an aural pleasure to hear. Due to Jordan’s relative quietness for what seems like the majority of the film we don’t hear much from Meloni, but what we do is pleasing as well. I really don’t have much to say about the voice acting since it was so perfect—which is to be expected when Andrea Romano is behind the casting. I think the greatest compliment I can pay to this film is this is the first DC Universe title I watched where I felt like I was watching a story that was genuinely adult in nature—not just in visuals and dialogue, but in the themes it dealt with. It was also the one that had the least pandering to the younger audiences by playing it safe at times; yes, I know Wonder Woman sent heads flying off of shoulders, but that even seemed to me like something that was done just because it could have been. It’s hard to put into words what I mean exactly, as even though there have been more violent depictions in other DC Universe films, sometimes it just felt like it was there because they could; to me, for Green Lantern, it just felt like the action and violence that was there was all much more organic and natural. Not to knock the previous film as I’ve enjoyed those as well, but Green Lantern just feels more grown up to me. I don’t feel particularly over or underwhelmed by Green Lantern: First Flight. There are no real moments that stick out to me as overly jaw dropping or pleasing to behold; the fights, while exciting, just didn’t have much of a punch (again, aside from the one death) to really separate themselves from something we’ve seen before and were I not so entrenched in the world of DC animation I would probably find this film even more amazing to behold…but as is I’m merely satisfied with it. As I said before there wasn’t a lot of hype to build this film up, simply because it seemed like there wasn’t a lot to get excited about with this one…and while that could still be true, it’s still something I Recommend. Warner sticks close to home with the external presentation of this release, matching the previous DC Universe films well. A reflective foil embossed cardboard slipcover is included to shield the Elite Blu-ray case below it. The case, by the way, is green—something I’ve only previously seen with The Incredible Hulk Blu-ray release, so your collection of blue cases will no longer look so strange with just one green blob amongst it—you now have two! Inside the case is the disc itself which boasts the same art as the cover and an insert for the digital copy and Warner Blu-ray rewards. Of interesting note is there is no dedicated disc for the digital copy—they seem to have (at least for this movie) gone completely online for this one, so you’ll have to download the copy rather than waste a disc on it. Something I have to commend them for—one less disc to have to produce, after all. Video arrives in the form of a VC-1 encoded 1080p feature and…honestly, how could you crew up an all-digital animation production on Blu-ray? You’d have to try real hard to, which I’m happy to say Warner didn’t—everything looks absolutely fantastic here. Some compression can be found in the faster moving scenes, but overall it looks fantastic. I’ve said it before and I’ll say it again and again—animation on digital formats such as DVD and Blu-ray look fantastic and with Blu-ray’s full 1080p HD resolution…it just looks all the more amazing. Of course that also means the mediocre CGI and awkward background plates are really clean and clear as well, but you take the good with the bad, I suppose. The Dolby TrueHD 5.1 mix once again disappoints—there just isn’t enough boom here. Surrounds are modest as well, rarely speaking up much and the LFE output is just so much quieter than I would like. They give these films the adult treatment in every other way, why can’t they mature the audio in a similar fashion? I want the room to thud and shake, dangit! Oh well; for what it is it still sounds satisfactory and everything is clean and clear. There is also a DD5.1 track included as well as English SDH subtitles. Those hoping for foreign dubs or subtitles will be disappointed—there’s nothing here. Remember what I said about Warner not trying in regards to screwing up the video transfer? Well, when they applied their method of not trying to ensure a crystal clear video, they forgot to switch to their other method (the one that produces sets like a five-disc Blade Runner release) and as a result we got a lackluster showing for the extras. To start, there is no audio commentary at all. I know the one on Wonder Woman got a bit dry at times, but it was our only peak into the inner workings of the film and now we have nothing on this disc that actually discusses the film aside from the “First Look” that we got with Wonder Woman. I get that there may have been mitigating factors that kept this release from receiving a proper commentary track, but the fact none of the extras try to alleviate this loss is just downright disappointing. All extras are presented in standard definition and include a Behind the Story with Geoff Johns (8:42) that discusses the history of the characters in the film…but not in a way that directly relates to the film itself, of course. I Am the Ring (22:31) is a Blu-ray exclusive look into the “symbolism” behind the ring in the series and…honestly, it has very little to do with Green Lantern and just really talks about items acting as power sources in ancient lore. It’s interesting from a historical standpoint, but what it has to do in relation to Lantern is limited at best. And certainly not enough for this to be the longest extra on the disc. A couple quick profiles of Sinestro (4:02) and The Guardians of the Universe (3:40) are up next, while our coolest extra is the First Look: Superman/Batman – Public Enemies (7:49). Talk about a reunion of awesome voices on that one. And from the looks of it that release won’t have a commentary either so…great. Although there is some roundtable with Conroy so that should prove interesting at the very least. Blackest Night: Inside the DC Comics Event (8:52) talks about some upcoming DC Comic event as told by Geoff Johns (as much as I like the guy, even he couldn’t get me interested in DC Comics again—I gave up that ghost a long time ago. About the same time they jacked their prices up again, but that’s another topic altogether). So is there anything worthwhile on this disc? Well…yeah. Duck Dodgers: The Green Loontern (22:22) is probably one of the most fun cartoons to be seen. It’s presented in fullscreen (no idea if it was ever in widescreen…I know it didn’t air as such, but whether it was animated in it either, I don’t know), at least for the Blu-ray release, and it’s just a ton of fun to watch. With Kevin Smith lending his voice to the work, it just turned out to be a fun look into the Green Lantern universe. Also included is a set of First Looks at Wonder Woman, New Frontier, Gotham Knight and five bonus cartoons profiling Green Lantern as seen in Justice League and Justice League Unlimited. All episodes included are in widescreen (yay!) except for “Hearts and Minds” which is in matted widescreen (boo!). And…that’s it. That sounds like a lot (four hours worth according to the front cover), but there just isn’t anything here really worth watching. The “I Am the Ring” thing is cool for history buff’s but not enough to warrant the Blu-ray purchase (if you can’t afford it, that is; the video transfer alone is worth the Blu-ray option, obviously, but just saying don’t let that extra be a deciding factor). Overall the film is definitely worth checking out but this release…I’m genuinely conflicted. 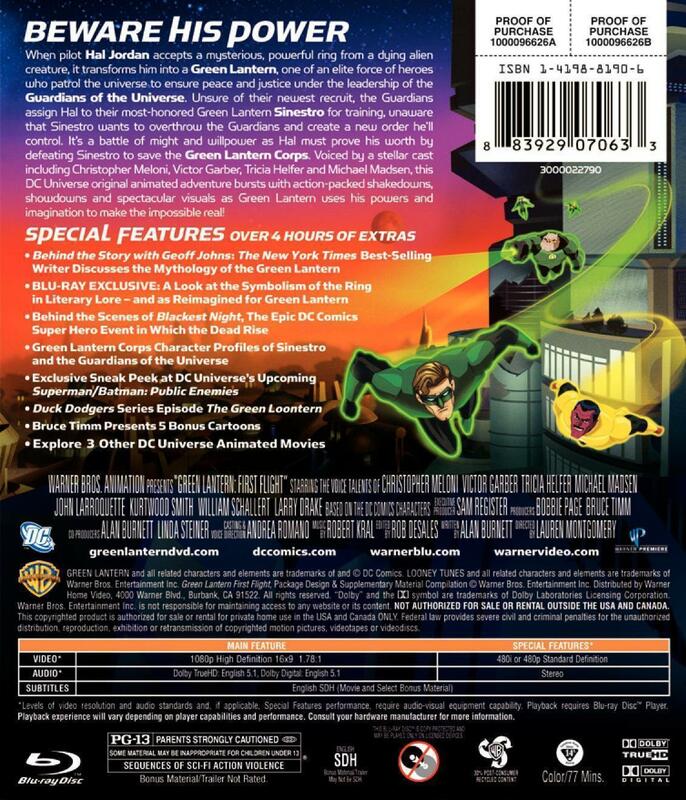 Nothing in the extras on this release even focus on the film (at least not in a way we didn’t see on Wonder Woman) so that in of itself is disappointing…but “The Green Loontern” really is good TV so either way you cut it, if you’re a fan of DC animation then this comes Recommended. If you aren’t…well, then a Rental should suffice. 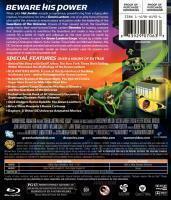 Green Lantern: First Flight is now available on DVD and Blu-ray.